ONE New England - Relish: It’s About the Cupcakes, Stupid! Home » FOOD AND WINE » MASSACHUSETTS » Relish: It’s About the Cupcakes, Stupid! How does a sandwich shop tucked away in a mostly residential section of a crowded tourist town become more than just another sandwich shop but a destination? 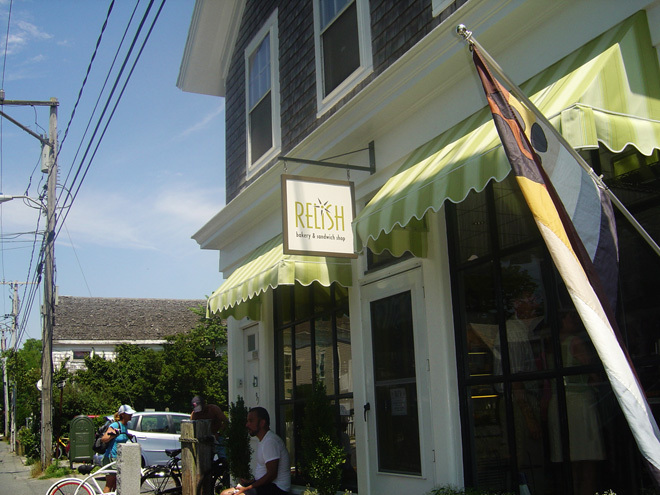 Relish, in Provincetown’s desirable West end, has developed a reputation and following that make it a must for breakfast pastries, sandwiches, salads, snacks, desserts and, of course, the cupcakes which many claim are far better than New York City’s famous cupcake emporium, Magnolia. One is often asked when on Commercial Street, “Is this the way to Relish?” There is no indoor or outdoor seating, so the crowds of patrons either take their food with them to the beach or crowd the few benches and block the narrow street. 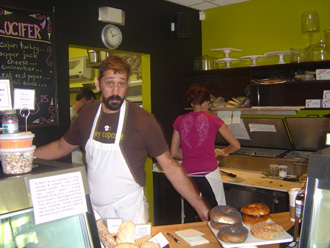 Relish was founded by Massachusetts College of Art graduate Frank Vasello with two partners in 2001. Like many aspiring artists, Frank worked in a number of restaurants in the Boston area including Michelas and Rialto in Cambridge to support himself and his art. But being Italian with a heritage for loving food, he soon developed a love of the restaurant business and with the skills and habits acquired working with top chefs like Jody Adams decided to take the leap and open his own place. Now the sole owner, Frank makes it clear that he is not a chef but a dedicated “foodie” who uses his own palette and learned skills along with those of his crew, Mark Bucholz, Nathan Butera and Robert Murphy to create the range of offerings that has made Relish so successful. What makes Relish so interesting and so successful is that it offers great traditional foods with a creative twist, as well as new and inventive creations. For example, Relish’s potato salad with onion and pickles and his fresh tomato, mozzarella, basil salad is testimony to a commitment to using natural locally grown produce. New and different salads are a daily offering that on the menu when I visited included a coconut curry Soba noodle salad and an Israeli cous cous with zucchini, pecorino, curry and tomatoes. Relish sandwiches add to the reputation of excellent quality and creativity that the shop enjoys, chunky chicken salad with pear and gorgonzola, salsa soaked turkey with guacamole and the quinoa and chickpea wrap with Asian slaw are favorites. While the cupcakes have garnered the reputation, the cookies, brownies, pies and other desserts live up to the taste standards established by the cupcakes. Although the store is only open from May till October, Relish has developed a year round business with the mail order sale of its full line of custom designed decorated gourmet cookies (Frank is an artist, after all). Shipping orders that are as big as 88 tins of cookies, Relish has sent cookies all over the world and to celebrities like Hal Holbrooke, Ellen Burstyn and a Princess of Jordan. Relish’s cookies can be ordered by ‘phone or through their website. Check Relish's website for up-to-date information.